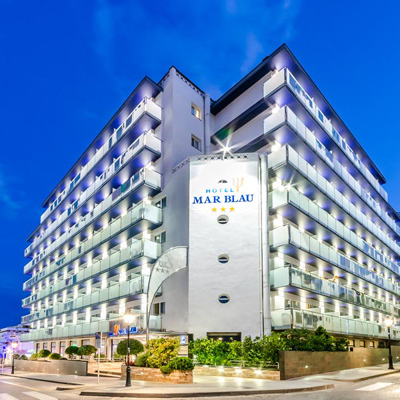 Mar Blau Hotel in Calella de Mar - Official Website. Mar Blau hotel is a 3-star establishment located just 450 meters from the beach and it is ideal for family fun. It is located in Calella, near the commercial center of the city and its main tourist attractions. The hotel has two outdoor pools, jacuzzi, gym, table tennis rooms and workshops for children, among many other options, offering a wide range of leisure activities to make the most of your vacation. In the buffet restaurant you can taste the renowned and delicious Mediterranean cuisine, as well as an extensive selection of international food. Located in Calella (Maresme Coast) by the sea and close to Barcelona. Standard and family rooms with all the amenities to make yourself at home. At hotel Mar Blau you will find all the services you need for a perfect holiday. Enjoy a wide range of leisure activities for the whole family. We have great facilities in a friendly atmosphere near the sea.